This year, Houston Elementary is offering registration for the 2017-2018 school year. 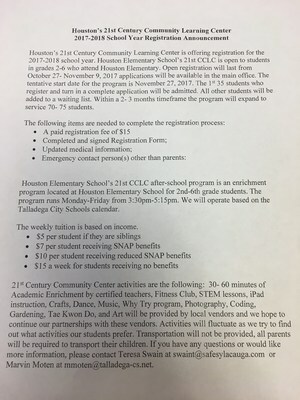 Houston Elementary School's 21st CCLC is open to students in grades 2-6 who attend Houston Elementary. The program will begin on December 4. Applications may be picked up in the office. A representative from CCLC will be at the PTO Meeting on November 16.